Police firing teargas teargas(file photo). 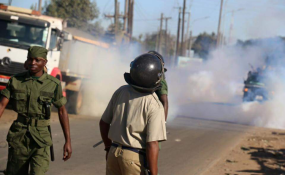 There was drama in Lira town on Monday when police fired teargas to disperse a group of youth protesting against what they called numerous corruption cases at Lira Municipal Council. Police intervened after a tipoff that the youth clad in the ruling National Resistance Movement (NRM) party colours (yellow T-shirts) were moving to lock the municipal council offices, including that of the mayor and town clerk, as part of their protest. Riot police officers arrived in two police patrol pickups and deployed around Lira Main Market, 200 meters away from the municipal council administration block before they fired teargas as they engaged in running battles with the youth. The protestors carried yellow placards inscribed on; "Lira Town Clerk Must go." At least 10 of the protestors were arrested. The youth said they were protesting against Shs20 million that municipal authorities allegedly deposited into the bank account of a cleaner at Uganda Technical College Lira with intentions of diverting it from the intended purpose. The protest comes barely a day after the NRM spokesman in Lira District, Mr Jacob Ocen warned its members against the demonstration saying it would portray the party negatively. Lira DPC, Mr Joel Tubanone told Daily Monitor that they dispersed the youth because their demonstration was illegal. "They did not inform us. Someone tipped us off that there was a group that was trying to move on our streets; trying to illegally demonstrate and when we got the information we had to intervene," Mr Tubanone said.